Lulu*s Dress c/o // Nordstrom Jean Jacket- & on sale!! Happy Monday and hello new favorite dress! I never knew a dress could make you feel so pretty and girly! For being a usual "jeans and tee" kinda girl, it's a bit of a good change to glide around in this pretty dress. It was, however, a little tricky with Olivia climbing all over and trying to eat it half the time. Let's just say this may be my new "date night" outfit when we don't have Olivia! ;) I also can't show off this bag enough! Thank you Nordstrom Anniversary Sale for one of my favorite all time purchases! In other news, today is a big day! I haven't said much about it, but I got offered an awesome opportunity to work with Marshall's on their ProjectFab and am off to Boston today to the Marshall's headquarters for a few days! I am so excited but also so nervous to leave my little one for three whole days! You would honestly think I was leaving for the next three months I have been so anxious, haha! It may seem silly, but this will be the first real time I've been away for her for more than a few hours, so wish me luck!! Love everything about this look! 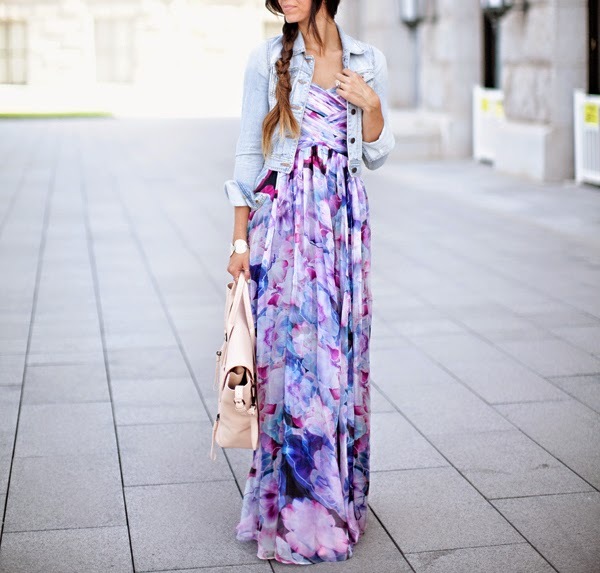 The gorgeous dress, denim jacket, heels, and that bag!! So pretty, love your style! This dress is amazing on you! Such a pretty look. Thank you so much! This dress would make any girl feel like a princess! It's such a fun dress! Ah, I'm so sorry! I would watch for it again soon because I bet they will restock! It was such a hot item they hopefully should get more! This is so amazing! LOVE that dress and bag! You look stunning. This outfit is gorgeous! I seriously need those shoes and bag... Congrats on such a great opportunity! I'm sure your baby will do great, but it will be great for you to get back! You look so cute as always. I love your style. Thank you so much! It was definitely a neat experience but I was so excited to see my baby when I got home! This dress is gorge! Very lovely :). Congrats you deserve it! I am sure she will miss you but she will be fine :) have fun! That dress is amazing! Where were these photos taken? Love the location. Stunning dress too!! These were taken at the Capitol in SLC! Thank you! The location was beautiful!